When Wyammy Ranch was established as a Quarter horse ranch by the Slissmans in 1960, JoAnn, who was an active hand spinner, realized the need for locally produced, high quality hand spinning wool. 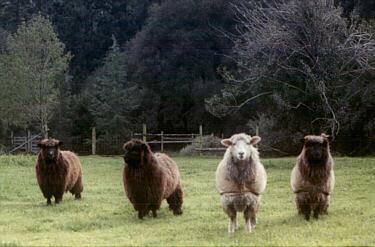 The Wyammy Ranch sheep flock was established with the primary goal of producing premium hand spinning fleece. 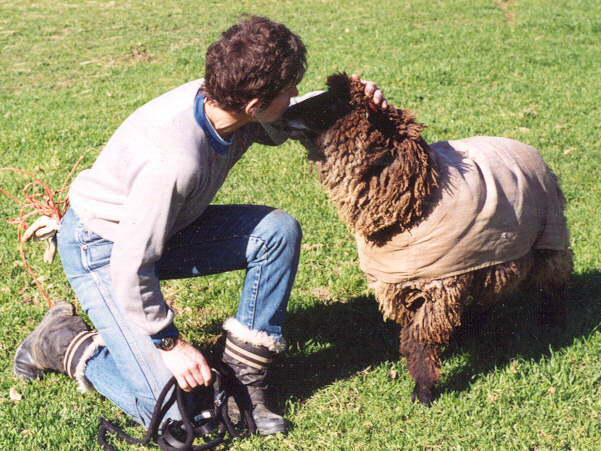 Each sheep was selected for fleece quality as well as breed type and good conformation. Romneys were chosen for easy spinning wool with silky handle and high lustre and for the superior ability of their wool and feet to adapt to the wet conditions at the ranch location in Western Sonoma County. These sheep produce white and colored wool. A few Targhees and Corriedale were added to produce softer, finer fleece and for greater range of wool types. The sheep flock is yearly maintained at about 30 ewes due to limited space. Ewes and lambs are sold annually to keep the flock size manageable and work load reasonable. All sheep wear blankets throughout the year to protect the fleece from weather and sun damage and produce the cleanliest fleece possible. On shearing day, fleeces are skirted by other hand spinners and prepared for sale. Many are bought by spinners that same day. Shearing day is open to the public. Visitors are welcome throughout the year by appointment. Contact the ranch if you are interested in seeing or purchasing sheep or fleece, or watching shearing in the beautiful coastal redwoods of Western Sonoma County. This site was designed by Wanda Smith. It was last updated on 8/29/07.